Here are some of the moments lived during these 3 days in the city of Girona. 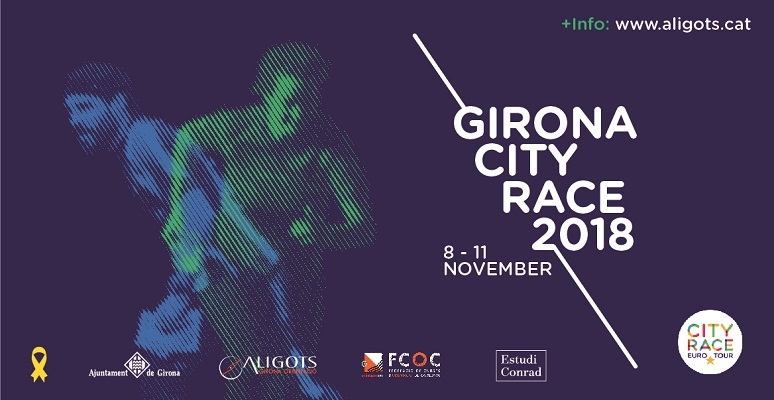 For more information contact: gironacityrace@aligots.cat. Printed maps of training available to participants. Circuits without controls. Maps of Can Vilallonga (Cassà de la Selva), Requesens (La Junquera) and Vallfogona del Ripollès. 7pm Club training open to all participants on the map of Montilivi, Girona. There will be no runner bag nor numbers. Due to lack of space availability, on Friday afternoon we will NOT OPEN the Fontajau Competition Center. As announced, we will open on Saturday at 10am. 6pm First starts of the night sprint in Montjuic Castle, Girona. Starting starts will be from 6:00 pm to 8:00 pm. 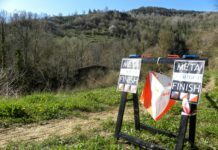 10am The competition center in Fontajau opens for collecting the race material with a possibility for late entries. 10:30am First starts of micro sprints organised by the juniors of the club. 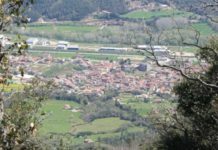 11am First starts of the middle distance race in Fontajau, Devesa, Puig d’en Roca and Ribes del Ter. 8am The competition centre in Fontajau opens. 8:30am First starts of micro sprints organised by the juniors of the club. 9am First starts of the long distance part of Euro City Race tour in the old town and surroundings. (Available in 4 languages, CA by default and selecting the options ES | EN | FR on the top right). That allow one-time registration to races of 2 or 3 days, with the same category and data. The 3 days pack is not active for the Open categories, because there are not these categories in the race on Friday. Online registration until 2nd November 2018, WITH DISCOUNT UNTIL 28th of OCTOBER. The possibility of online registration is closed on November 3 and it will only be possible to register on the race day according to map availability. For these races we will only accept cancellations of registrations with just cause until October 28th. The amount paid will be returned minus the possible expenses. 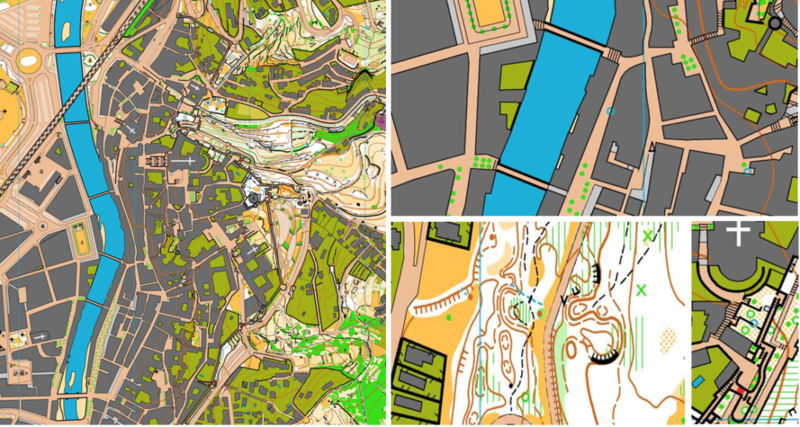 Foreign runners have to select the "Orienteering Internat. Club" option from the Clubs list, and indicate in the Other data field the name of their club and the license number. Mini-Sprints of the youth team "FALCONS, Saturday 10/11 and Sunday 11/11: No prior registration is required. 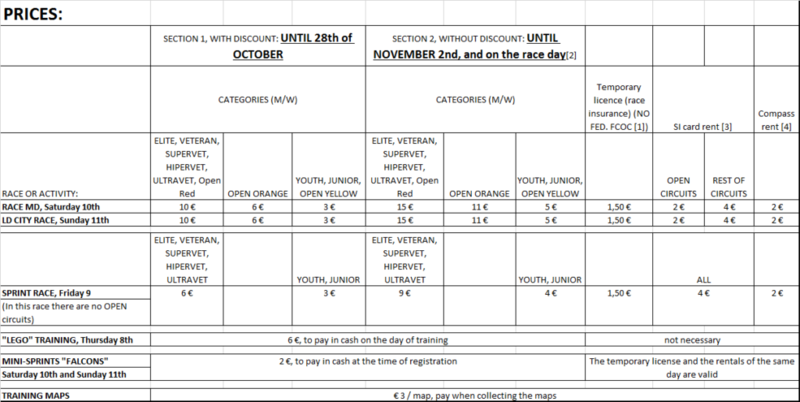 Training maps before and after the races (from October 29 to November 17): They can be bought from NEUSPAPER Papereria, Hortes street, 17, 17001 GIRONA for 3 euros per map. IMPORTANT!! The participants not holding the FCOC (Federació de Curses d'Orientació de Catalunya) licence will be charged the temporary licence (race insurance) given the impossibility of checking the conditions of insurance coverage of different federations. 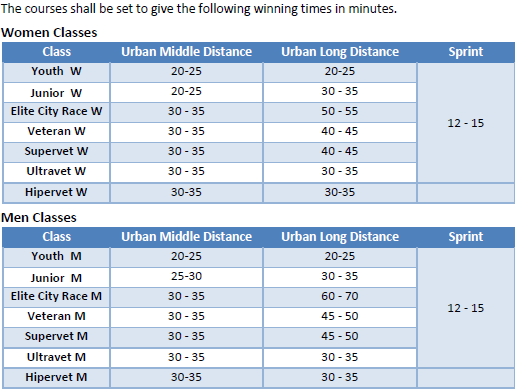 As explained above, entries on race day are subject to map availability, which we cannot guarantee. The races are timed and controlled with the SPORTIDENT system. If you do not have a Sportident card, it will be necessary to rent it. At the time of collecting the SI card, you will need to leave € 50 or an identity document as a deposit. The deposit will be returned when the card is returned after the races. The possible rental of compass (recommended if you do not have your own, although not necessary) will be paid at the time of picking it up. Also in this case you need to leave € 20 or an identity document as a deposit. NO number bibs will be used. Please check in the lists available in the competition centre that there is no incident on your registration. In case of incident or renting SI cards, you will have to go to the registration table to resolve it. The start times will be posted a few days before the competition on the web. The timing of RED, ORANGE and YELLOW OPEN circuits will begin with a START punch, and there will be no assigned start times. 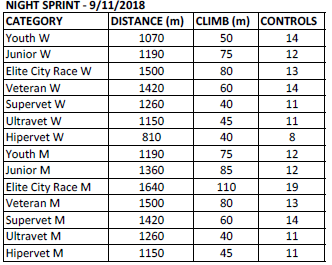 The Sprint race on Friday 9th will also be with START start system, without previously assigned hours. 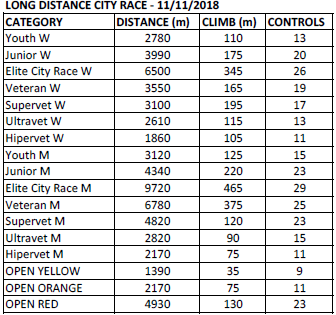 The prizes will be given based on the results of GIRONA CITY RACE TROPHY 2018. 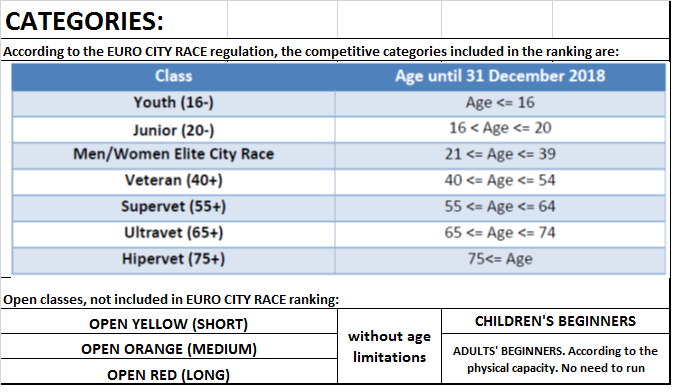 The results of the trophy correspond to the sum of the results of the MD race on Saturday and LD CITY RACE on Sunday. Prizes won't be given in the open categories. 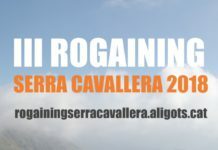 Technical information of each race will be published soon, with distances, climb and comments from the course setters. Map of Girona and surroundings, mapped with SPRINT ISSOM2007 regulations, scale 1: 5000. Recently updated. Mostly urban with rustic areas around the city. If you decide to retire from the race, make sure to stop by the SI download to avoid any unnecessary worry and search party. Maps will be available in O-Track so that you can download your tracks after the race at www.o-track.dk. Our course setters made a big effort trying to design attractive races! We’ll have a special competition centre in Montjuic for new entries or to collect race material (SI card, compass, etc.) so that you don’t need to go to main competition centre in Fontajau before the race. Fontajau wil be also open just for Saturday-Sunday related topics. 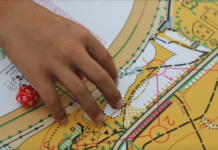 The courses have been designed to keep the runner at maximum concentration and thinking about the best route choice at all times. A lot of attention in reading the map will be required. The characteristic that best defines Montjuïc Castle is its well-preserved walls, which generate what could be compared to a large maze. In addition, some underground passages and the detailed cartography of the map will make runner’s decisions important in order to correctly execute each section. The races are typical Sprint races, with micro-elections at all controls, an important physical component and winning time of about 15 minutes. In addition, the darkness will be a plus, making it even more technical. You have to be careful in some areas, especially so in the dark, because of stones and rocks on the ground and the height of the walls. Only longest races reach places that could be considered of some danger because they are on top of the walls. We will mark these sites with tape, as a kind of railing. It is recommended to use leg protection. The use of studs is also recommended. This race will have a pre-start of 15 minutes (before start time). Distance from pre-start to start is 900 metres. City market will be crossed on the way to start. Please be careful with people walking and carrying shopping bags. We have chosen a map with two very different areas. The first part will be in a forest area with varying penetrability, path network and some rocky elements. It has a moderate climb and it will be important to take this into account in the route choices. The second part of the race will take place in a totally different area: almost flat parks where a good use of the compass will be needed and with some unexpected elements. Courses are typical middle-distance ones, with many controls and changes of direction, but that also require careful map reading in order to make good route choices and minimize the climb in the first part or optimize the distance and the attack to the controls in the second part. In the race there will be a neutralized area of 330 meters for all circuits that run through streets with open traffic (we ask for maximum caution and to follow the instructions of the organizing staff). The maximum neutralization time will be 5 minutes. It is recommended to use leg protection. The use of shoes with a good grip is also recommended. There is no pre-start for this race but distance between competition centre and start is 1.200 metres (15-20 minutes). Some streets open to traffic will be crossed to go to start. Please be careful. Going to competition centre before the race is not compulsory for runners with no incidences. New entries, SI card or compass collection or any other incidences will require going to competition centre previous to the race. Please note that after the race you will need to go to competition centre to unload SI card. Route will be marked with tape. The races are designed so that the runner will have to give their maximum both physically and also in making route choices. Courses take us through the most emblematic and unknown corners of the old town and also to magnificent viewpoints of the city of Girona and its surroundings. The races have a long-distance format, so they include long controls where the choice of route will be paramount. 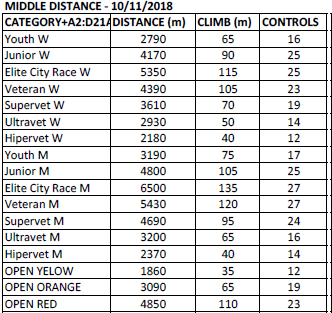 As you can see in the distance summary table, the climb will be a very important factor in the route choice. The terrain is very diverse. It combines Girona’s old town, with many different angles, alleys, stairs and walls, with a residential area in Montjuïc neighborhood, and Les Pedreres and Sant Daniel’s valley with rustic areas and urban parks. This variety of area during the race means that leg protection is recommended. The use of shoes with good grip is also recommended. There will be refreshments at the finish of the Saturday MD and Sunday LD CITY RACE races. There will be an ambulance attending any immediate injuries (Friday, Saturday and Sunday). There won't be organised child care. The parents should indicate their wish for separate start times with the entries. 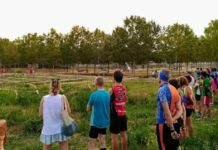 These related establishments, members of the Associació d'Hostaleria Turisme i Restauració of Girona, present the following special offers for the participants in the GIRONA CITY RACE 2018.